In this life, we are going to have troubles even when we aren’t the instigators of it. Rather than attempting to live a trouble-free life, it’s much better to expect bumps in the road and dig deep in our spirit to find joy in the midst of it. There’s joy that comes from knowing that God is in control of every single situation in our lives. “By the grace God has given me, I laid a foundation as a wise builder, and someone else is building on it. But each one should build with care” (1 Corinthians 3:10). God gives us great grace to accomplish His will right where we are. Being on the receiving end of undeserved grace and mercy makes it easier to pass it on to others. Giving grace is the ability to release our loved ones to experience everything God has created them to be and allowing them to make mistakes along the journey without being condemned. “But encourage one another daily, as long as it is called “Today,” so that none of you may be hardened by sin’s deceitfulness” (Hebrews 3:13). There’s always something to bring people down—a discouraging word, a disapproving look, or disrespectful actions. Sometimes we have to bring the joy with us when we show up in the home, work, church, or community. Great personal joy happens within us when other people are inspired by our words and actions. “But since you excel in everything—in faith, in speech, in knowledge, in complete earnestness and in the love we have kindled in you—see that you also excel in this grace of giving” (2 Corinthians 8:7). As believers in Christ Jesus, our legacy should be one of incredible generosity of our time, money, and energy. We are promised by God that He will supply all our needs and grant our desires according to His will. Our legacy is bolstered when we live unhindered by selfish ambition or hoarding earthly treasures for ourselves. It’s much easier to talk and think about forgiving others than actually doing it. However, God gives an incredible freedom to those who choose to forgive those who’ve offended them. Christ’s sacrifice at the cross is most modeled when we forgive as He has forgiven us. Everyone leaves a legacy whether they plan to or not. Many of us grow up believing that people love us when we do something worthy of their affection. However God has called us to love unconditionally as He has loved us. Through His grace, the legacy of agape love can reach throughout many generations of family and friends. “Because we loved you so much, we were delighted to share with you not only the gospel of God but our lives as well” (1 Thessalonians 2:8). It’s easy to take for granted the amazing gift of salvation given from God the Father through Jesus Christ. Yet every time I share the gospel and witness a transformed life—I’m more determined to reach out to the lost. It takes time and effort to disciple people in Christ, but God gives us the wisdom and strength when we trust in His direction. “Do not merely listen to the word, and so deceive yourselves. Do what it says” (James 1:22). If I could choose, I would rather leave a legacy of doing God’s word rather than just sitting around accruing knowledge about it. God’s word is a powerful motivator to get us moving in the right direction. However it’s only possible when I surrender my inability in the flesh and trust the Lord to give me what I need to follow through. “Their work will be shown for what it is, because the Day will bring it to light. It will be revealed with fire, and the fire will test the quality of each person’s work” (1 Corinthians 3:13). I’ve gained much satisfaction from giving my best in the work God has given me to do. It isn’t always easy and sometimes I’m tempted to quit. However through perseverance and strength from the Holy Spirit, I’ve accomplished my goals and aspirations in the different seasons of my life to give a good day’s work in and outside of the home. “But in keeping with his promise we are looking forward to a new heaven and a new earth, where righteousness dwells” (2 Peter 3:13). 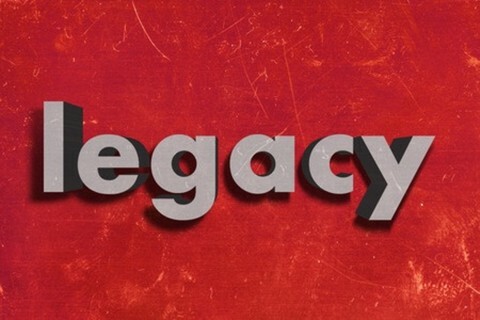 If there was only one legacy I could leave—it would be the hope I have in Christ for eternal life. Every day I must live as if it were the last one on this earth considering the question: what would I bring to heaven? The answer: nothing, except what I did in the name of Jesus leading towards heavenly riches. Everyone leaves a legacy whether they plan to or not. Everything we say or do leaves the imprint of our lives on those around us. As long as there is breath in your body, there’s an opportunity to leave a rich legacy of hope. Start your legacy list today and begin to live in the fullness that God created you to experience. Thank you for the writing..I am using some of our key points in a devotional I will present.